Yelloweye rockfish poached in miso soup with black beens, sweet corn and summer squash. The broth is sweetened with honey and spiced with a Jamaican-style rub for a little heat to balance out the sweet. In Japan, I was served a dish featuring carp cooked in sweetened beans. It was good, though a bit sweet to my tastes. 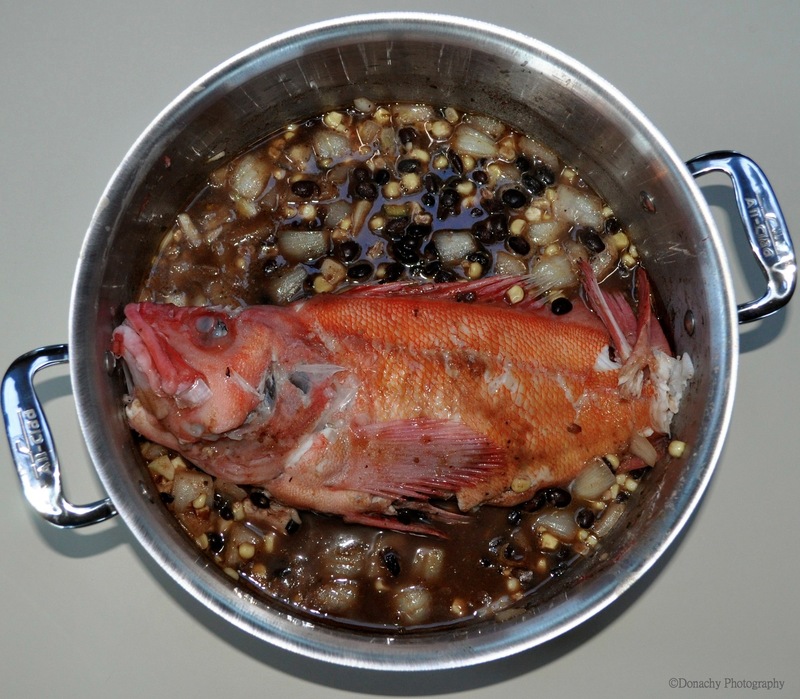 Later, I began catching kurosoi, a black rockfish (genus Sebastes) common in northern Japan. After broiling a couple of them, I knew I had a good candidate to try in a spicier bean dish. 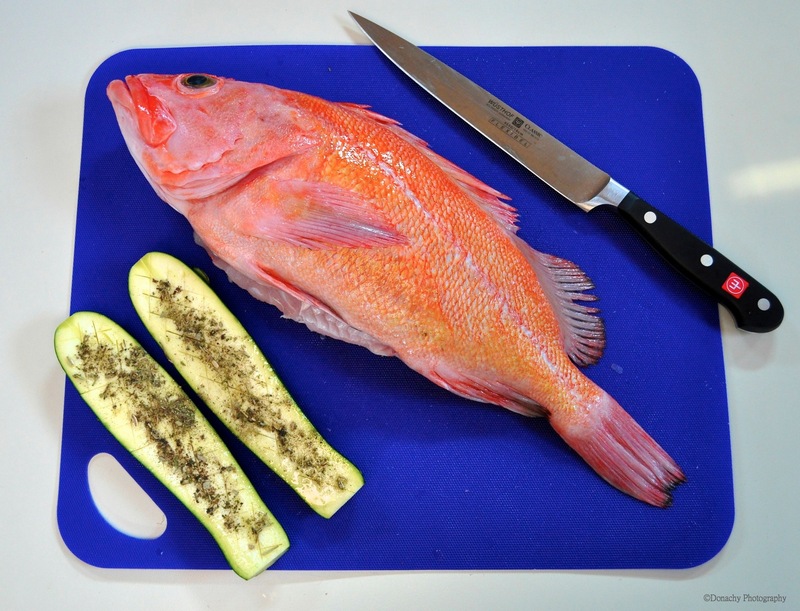 Two pound rockfish such as this yelloweye are perfect for a whole-fish-for-two dinner. A small zucchini, cut in half, scored, drizzled with olive oil and seasoned with herbs de provence, makes a nice side dish. A variety of firm, white-meated fish work well in this dish. Any of the rockfishes in genus Sebastes, black seabass, small stripers, snappers and porgy (sea bream) would be good choices. Any leftover broth from this dish can be served the following day as an excellent soup. One rockfish (or other fish with firm, white meat) weighing about 1 1/2 to 2 pounds with scales, gills and entrails removed. 1/2 tbsp Jamaican rub or other spicy seasoning featuring hot peppers. Cumin and oregano may be included in the seasoning, or may be added separately. Thoroughly clean the fish, pat dry with paper towels, and set aside. Over medium-low heat, prepare the miso broth in a pan large enough to hold the whole fish (an oblong poacher works best for this, but any large, round pan that has a lid will do). Add the beans, onions, corn, spices (including slices of chili pepper), olive oil and freshly ground pepper. Taste. Add salt and more spices, if desired. Cover with a lid and bring to a simmer. Add the fish, working it down into the broth. Carefully remove the fish to a serving platter. Arrange beans and vegetables around the fish and serve piping hot. 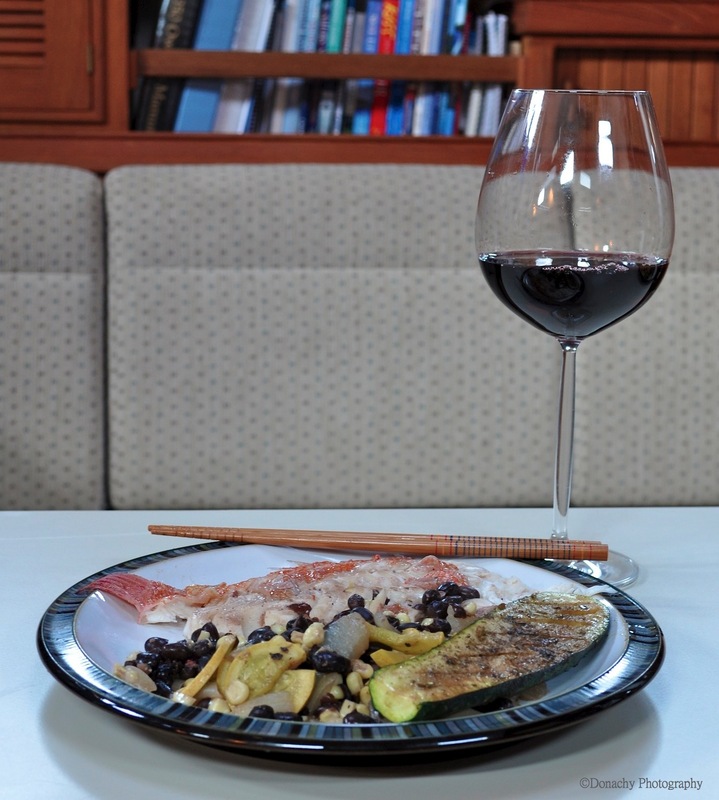 We enjoyed this fish with a red table wine from the state of Washington. Syrah, Malbec, or Merlot would pair well with this dish. 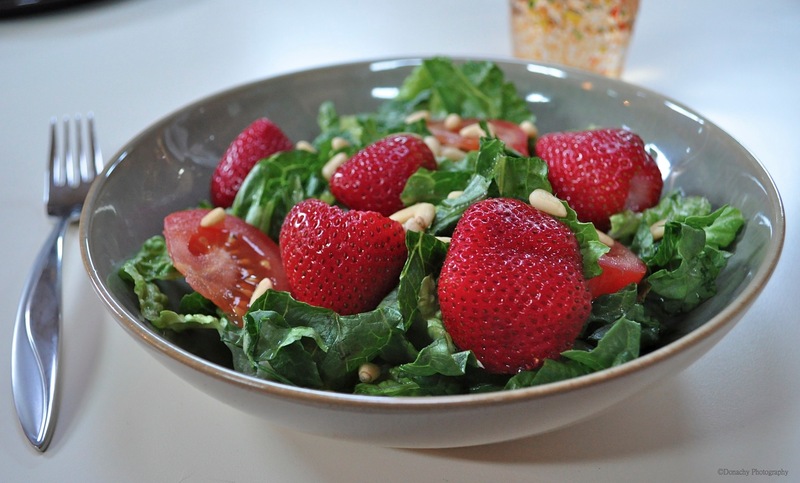 And don’t forget a colorful seasonal salad! Those beans look good…it is lunch and I’m hungry! But, first, my noontime run….